Now in its fifth year, AFA’s Choral and Voice program provides Houston area voice students with a unique opportunity to hone their vocal skills and technique while performing a rich and diverse variety of Classical, American and World repertory. Similar to the orchestra/chamber music model, students perform in both large and chamber ensembles in both accompanied and a cappella settings. Students also participate in a joint performance with the AFA Conservatory Orchestra. Choral students also have the opportunity to develop their solo repertory as well as take part in enrichment courses that enhance their vocal skills at all levels. All students participate in the AFA Chorus, performing a wide variety of repertory in a cappella and accompanied settings, as well as a performance with the AFA Conservatory Orchestra. Recent joint performances with the orchestra have included Haydn’s Little Organ Mass, Purcell’s Come Ye Sons of Art and Fauré’s Requiem. 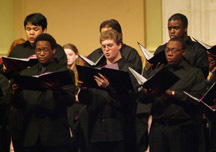 All vocalists participate in chamber choirs. Chamber choir focuses on performance of repertory designed for smaller groups and helps students develop important vocal and aural skills in this context. Chamber choir workshops emphasize teamwork, active listening skills, communication skills and leadership as students work together to perform in more of an individual context. AFA features an auditioned madrigals group, emphasizing early music and contemporary repertory. Students audition for madrigals during the first week of the program. Enrollment is at the sole discretion of the AFA Choral Director. 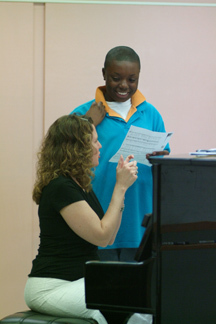 All voice students receive a minimum of three half-hour private lessons during the conservatory. Due to the limited amount of time students have with private teachers, AFA suggests that students come prepared to address any specific issues with which they may wish assistance. Items students may wish to address with private teachers include, but are not limited to, rehearsing and preparing chorus or chamber choir repertory, specific technical questions or concerns, receiving coaching on a solo they are rehearsing or preparing for upcoming contests and/or competitions. This type of focused, one-on-one interaction between working musicians and AFA students is specifically designed to help AFA students address individual musical goals. As part of their private voice lessons, all students participate in studio class where they gain valuable performance experience in front of groups and receive coaching from the AFA faculty. Voice lessons and studio class both culminate in a solo voice recital on the final day of the Conservatory. AFA believes in the development of a “total musician” by providing important academic training in voice taught by AFA’s accomplished choral and voice faculty. 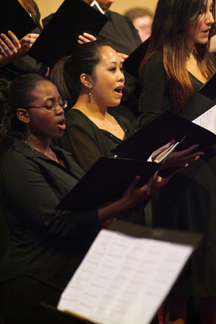 Diction and sight-singing classes assist students in improving their individual skills as well as their contributions to the singing groups in which they take part. These skills are considered essential to both effective solo and group performance. 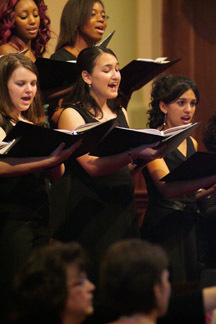 The 2007 Conservatory will enroll a maximum of fifty (50) singers. All choral applicants must perform a live audition. Accompanists at AFA scheduled auditions are provided. Early applications are encouraged.